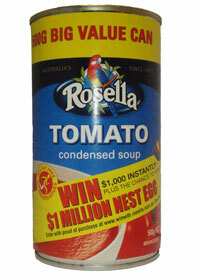 Tomato puree (90%) (Water, Tomato paste), Sugar, Thickener (E1422), Salt, Canola oil, Mineral salt (E500), Pepper, Flavour. Thank you SANZA, this is the best soup ever!!!!!!!!!!!!!! !